Being a mom, juggling work, and writing blogs for my Social Media for Business Performance course, keeps me very busy. My biggest challenge these days is finding time to go to a grocery store… or two… or three, just to pick up things I need for this week’s meals. Thank goodness for price matching! Time, is one of our most precious commodities yet every day we struggle with having less of it and craving more. So much so that we often succumb to paying a hefty price for it. It has revolutionized the way people buy groceries, giving busy professionals, parents, elderly, student’s and even businesses back valuable time they don’t have to spend shopping. The increased demand for this type of service has resulted in a large number of companies entering this online space. With competition being so fierce three factors will influence which business will rise to the top: Innovation, Speed of Delivery and Efficiency in their Supply Chain. The application of social media in the supply chain process is no longer an option but rather a requisite in order for a company to accelerate and propel ahead of the pack. 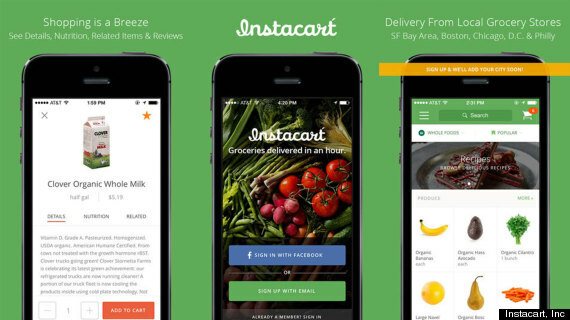 Instacart is a trailblazer in the on-demand market space. The company has revamped the landscape of the online grocery sector, promising a one hour delivery. They tackle the grocery problem with a fresh perspective. …can you say personal shopper anyone? A dedicated person who will deliver groceries from your favorite stores exactly when you need them so you don’t have to. An av ant garde Internet-based grocery delivery service has been revered by Forbes as “America’s Top 20 Of 2015 Most Promising Companies.”  From the aspiring mind of University of Waterloo Alumni, Forbes top 40 under 40 achiever, former Amazon supply-chain engineer and serial entrepreneur, Apoorva Mehta came the rise of Instacart in 2012. Traditional methods of ordering groceries online meant that a you would have to place an order hours, or days in advance. You could only select from preset delivery times that were available or undesirable. Plus you were limited to ordering from a catalogue of items from overstocked inventories or from just a singular grocer. Mehta, recognized the need to improve this prehistoric delivery model. Disliking the idea of grocery shopping, he decided to develop an app that would do it for him. From using his app he saw the need to solve a common problem. Engaging his friends, they all started using the app and the idea caught on like wildfire. Now, the only challenge was to draw in investors. Being able to provide consumers with choices; flexibility, speed of delivery and that oh so desired personal touch, was there ever a doubt that Instacart could land a whopping $220 million investment. Vishwa Chandra VP of Instacart, was asked recently how has online grocery delivery changed in recent years? Check out, pardon the pun, Apoorva Mehta’s talk at Start-up School NY 2014. He explains his journey to becoming a founder of a startup and the his inspiration for Instacart. Supply chain at its finest. Instacart has no physical infrastructure. They do not own warehouses, nor do they have a fleet of trucks or lease any vehicles. Plus they don’t need of any inventory. And they are in the grocery delivery business. How’s that possible? Through the use of their sophisticated software and leveraging mobile based crowdsourcing. What’s that you say? Anyone with a smartphone can download an app and become your very own personal shopper. A Personal Shopper – an independent contractor or a full time employee signs up and becomes part of their network. They are provided with an app that sends them customers shopping list, exact coordination of getting to various stores externally and every detailed instructions on the inside the store e.g. which isles to find item. This app also allows them to be in constant communication with the customer advising them of their arrival or any issues with items ordered. What’s remarkable about the Instacart experience is the human factor. An actual personal who shops just for you, your food isn’t coming out of a warehouse and being put in a box and dropped on your doorstep. Another ingredient of Instacart’s success is providing customers choices. They choose big box brands (Whole Foods Market, Costco, Petco), and even trendy niche stores like (Fairway Market, Bi-Rite, Plum Market). Most recently Instacart partnered with Target, this merger allowed both companies to go head to head with new comer Google Express and Amazon Fresh. Imagine this, your friend just called and said the gangs coming over for dinner at six. Wow you look at the clock it’s now three. You’re stuck under a crap load of work. You picture your fridge – there’s a bottle of mayo and a jar of pickles. What to do …what to do? Well, have no fear Instacart app is here. Simply click from your mobile device or in your case your work PC. Presto your very own fully trained personal shopper will pick up those ingredients to make your party rock! All this in the nick of time and not to mention from your favorite stores to boot. How can you beat that. Instacart believes that communication is vital. The latest version 4.12 of their app is smarter and more efficient. It now incorporates email and texting. Another nice feature of the app is that it allows a customer to choose substitutions for all items in case they were out of stock. There is also an option to have the personal shopper call to confirm any replacement purchases. Another vantage point is that the app sends a survey after each delivery. This timely feedback is critical as it provides Instacart the ability to assess their service and see how the personal shopper preformed. Now that’s what I call efficiency at its best! Being keen on what’s shaking in my backyard I tried reaching out to Apoorva Metha for further comment. I still waiting to to hear back to find out why he didn’t expand north across the border? To improve your business and see where a change may be necessary due to supplier or customer needs you must get constant and timely feedback. To remain competitive you should be innovative, whether it be the way you deliver your service, the speed in which you do, or the technology you use to get you there. Remembering who your customers are and feeling their need for your service by adding a personal touch can make the difference whether they chose you or the lower priced option out there. The use of Mobile Crowdsourcing and software driven implementation makes it easy for a company to expand to new cities extremely quickly as there is no overhead, low fixed cost, and limited capital expenditure. To illustrate, David Schloss, General Manager at Instacart, in the interview below provides insights on his quick expansion in the city of Boston.